If your dog is about to lose a leg, be sure to have a chat with your vet about pain relief. Specifically, the kind of pain relief your pup will have. When you have that conversation be sure to ask about NOCITA® by Aratana. It’s a new post-op dog amputation pain relief drug for dogs that can make recovery much easier. Dog Amputation Pain Relief Without Pills? Yes! 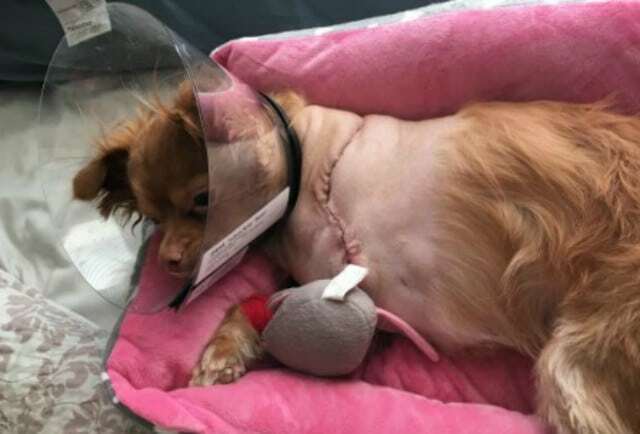 Bambi Bella recovers from amputation surgery. Many pets will show signs of pain long before the next pain relief drug dosage is supposed to be given. It’s critical to take time now to learn how to read pain signals in cats and dogs. If your pet doesn’t return home with enough pain medication, recovery can be a nightmare. And even if your cat or dog does have enough pain medication for that first week, you may need to work with your vet to fine tune the dosage and timing of each drug. That’s a lot to think about! What’s The Big Deal About NOCITA®? Learn more about this new post-op pain relief drug for dogs. For many years most new Tripawd dogs have returned home with a combination of drugs such as Fentanyl, Gabapentin, Tramadol and sometimes Amantadine, among others. But recently a new non-narcotic extended-relief option was released into the marketplace. Your vet gives it while a dog is still under anesthesia. Once injected, it gives a dog three entire days of amputation pain relief — and you don’t have to do anything to make that happen! NOCITA® is produced by the veterinary pharmaceutical company Aratana. It’s been used in human medicine for a while but in those circles it’s known as “bupivacaine.” This non-narcotic, local anesthetic is administered in a long-acting injectable formula. In humans it’s been proven to give post-op pain relief for as long as 72 hours. 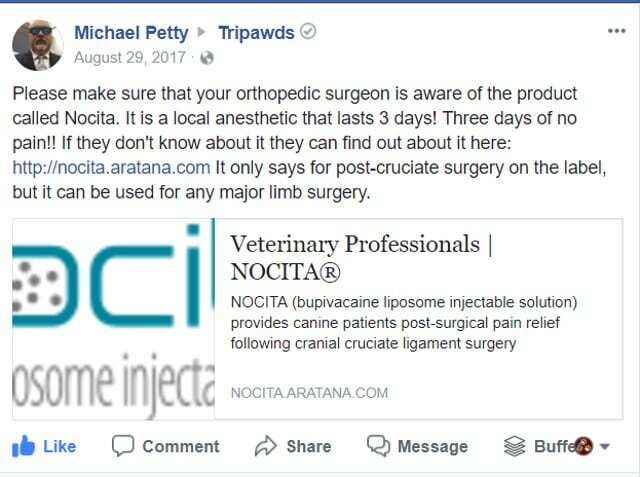 Aratana studied bupivacaine for the use in dogs, and when clinical studies showed similar results for them, the company released it as Nocita, the newest option for dog amputation pain relief. During surgery your vet will inject the drug, which numbs the amputation site. It’s specially formulated to slowly release bupivacaine over time. This slow release makes it possible for Nocita to control pain after surgery for up to three days with just a single dose. Unfortunately Nocita has only been studied for use in dogs so far, but we hope that Aratana will soon release it for cats too. We will let you know as soon as they do. Tripawd Tuesday: Emerson the Labrador is Back at the Beach! It’s a Greyhound Tripawd Tuesday Celebration!